I needed to have some work done on my mountain bike in preparation for Leadville – so I thought I would throw the kids bikes in the car and have a little fun on the Lakeshore Trail and the Vulcan Trail. Into the car went both the kids bikes, my mountain bike, and my road bike. Josiah’s bike went in the front passenger seat, and the other three bikes went in the back behind the kids. These are the pics I got of our journey. Warming up in the parking lot – doing tricks already! This entry was posted in Training and tagged birmingham, kids, photos on August 6, 2012 by kartoone. 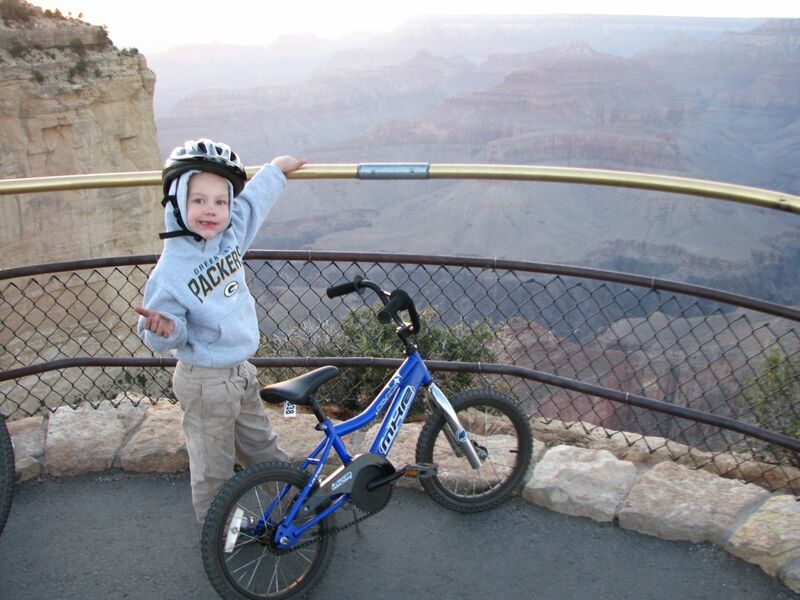 Josiah showing the view looking west … note we were able to ride to the edge of the canyon because Maricopa was empty! The views were great, but there was a lot of traffic, and the wind was horrendous. 20+mph steady headwind with gusts up to 50mph. Once I finally made it to Valle, I was hoping for a cross-tailwind, but instead it was just a nasty knock your front wheel sideways crosswind. 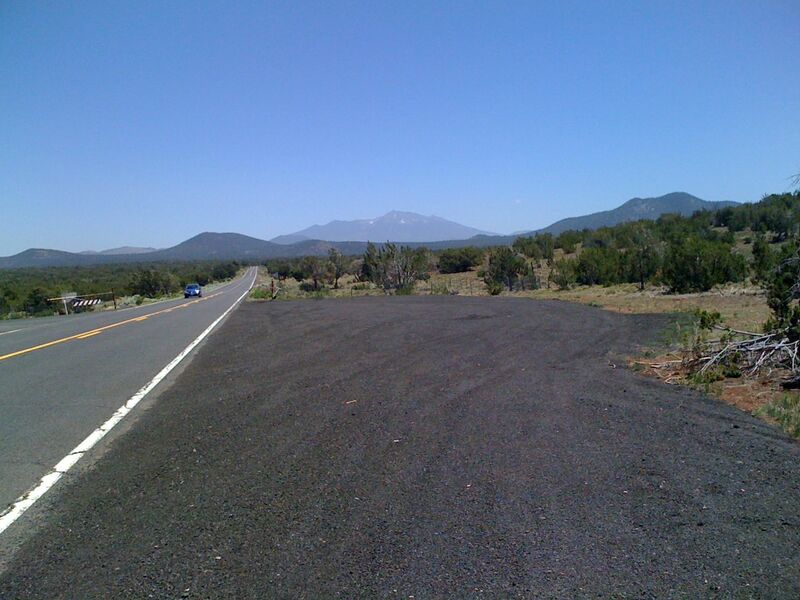 As the road climbed gradually towards the San Francisco peaks, the wind got increasingly worse. Eventually, going across the Kendrick Park meadow, the wind was sustained at 30-40mph with gusts probably in the 60mph range. It is easily the worst wind I have ever ridden in. The only redeeming part of the ride is that after about a mile or two of descending from the high pt of 8046′, the road had bent enough to give me a tailwind. So I had a fast downhill with tailwind to end the ride. I made it to the Snowbowl climb turnoff ahead of Kristine, so after waiting a few minutes I headed up the climb even though I was tired and out of food. Shortly after starting the climb, Kristine drove up so I gladly called it a day – I had had enough of the wind. 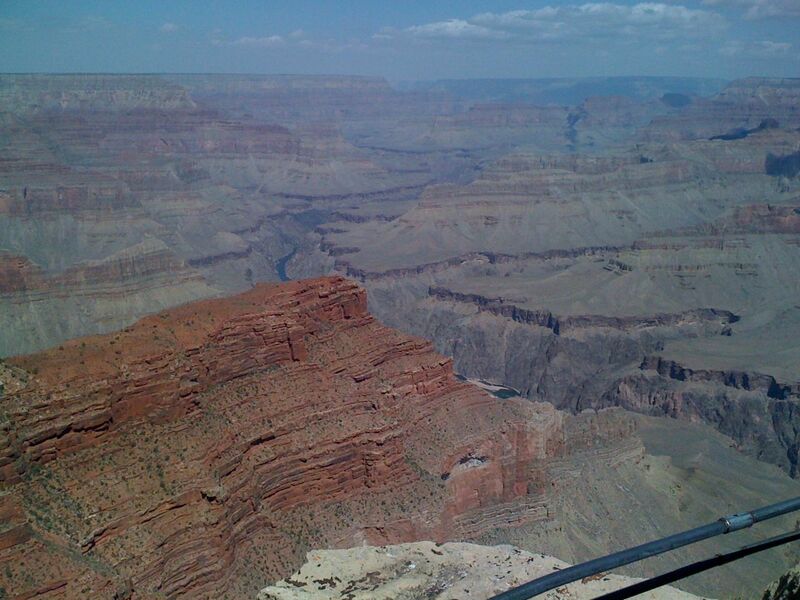 The views were great – see these pics from Hermit Rd in the grand canyon and much later in the ride approaching the San Francisco peaks. We drove down to Phoenix later in the day on Friday arriving while everyone was at the rehearsal dinner for the wedding. The next morning Josiah and I went for an hour long ride exploring the very cool canal trail and tunnels while Kristine did a 5K running race with her cousin, Kimberly. 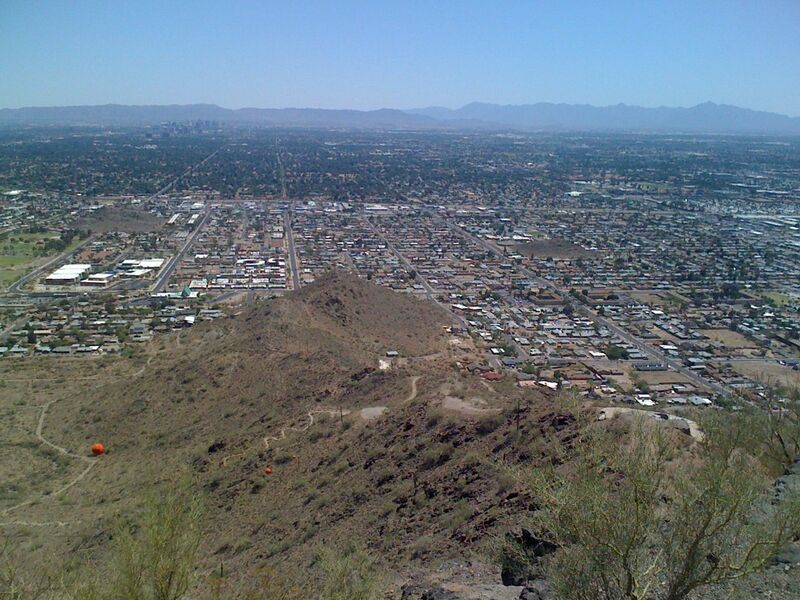 When they got back, my uncle Jim helped guide me through the canal tunnel system over towards Camelback Mountain and Mummy Mountain where I tried to find every way possible to get high up on the mountains. There were many mansions built into the side of the hill with super long, steep driveways but they were all gated-off private property. 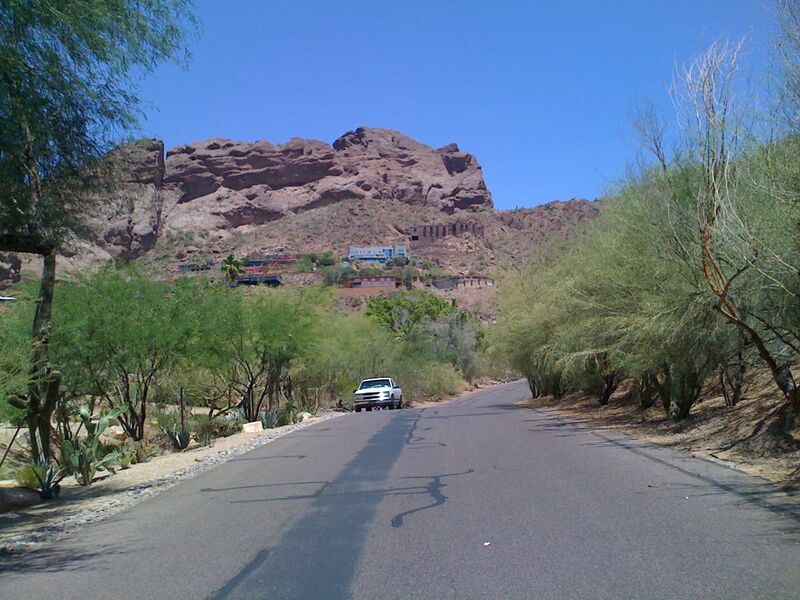 Still, the roads leading to the driveway were really fun with several steep sections. 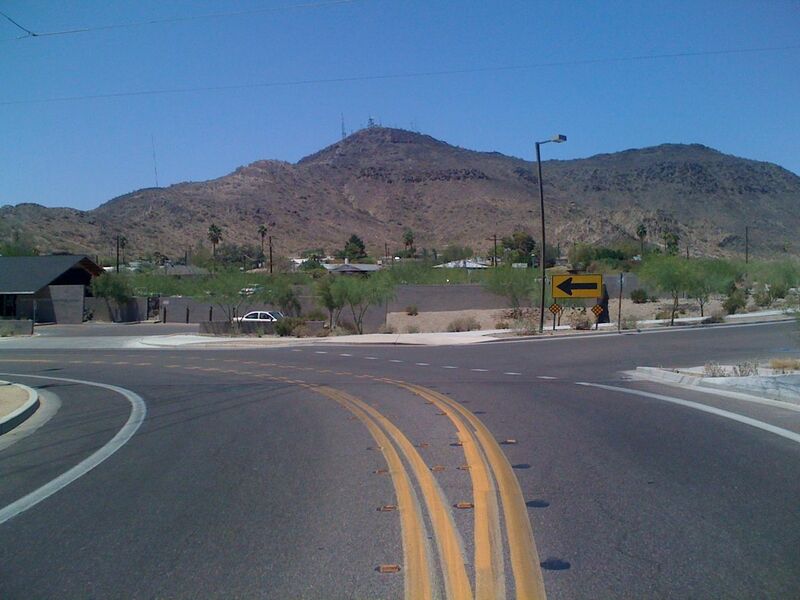 The ride down Central Ave to South Mountain was relatively easy with a bike lane for most of the way. 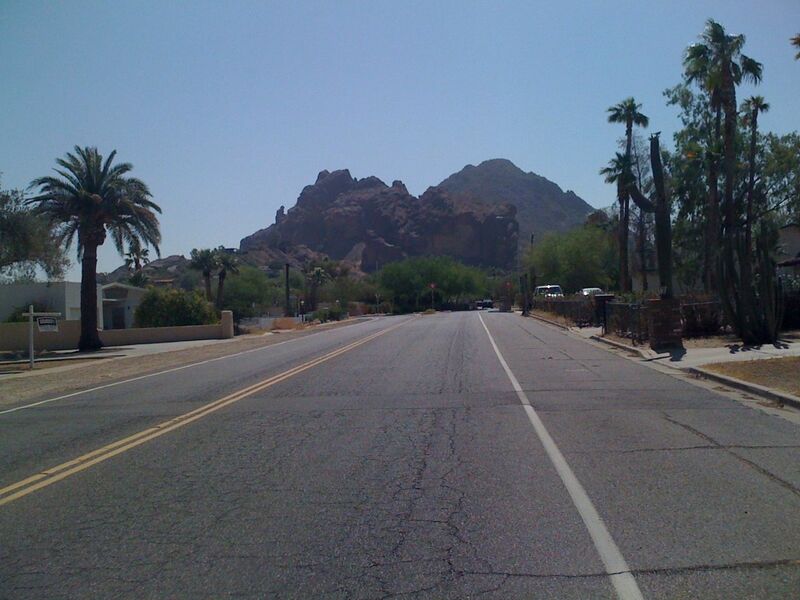 The route when straight through downtown Phoenix, which was deserted on a Sunday morning. Most of the lights could be timed so that I think I only had to wait at one or two lights. This road takes you directly into the climb. The Strava segment that I had looked at was the one that started at the restrooms so when I passed a parking area that looked like it had restrooms, I drilled it. I was trying to maintain 350 watt average, but after about 5 minutes of this, my average started to slowly come down until I ended up with a time of 24’27” and a 324 watt average. 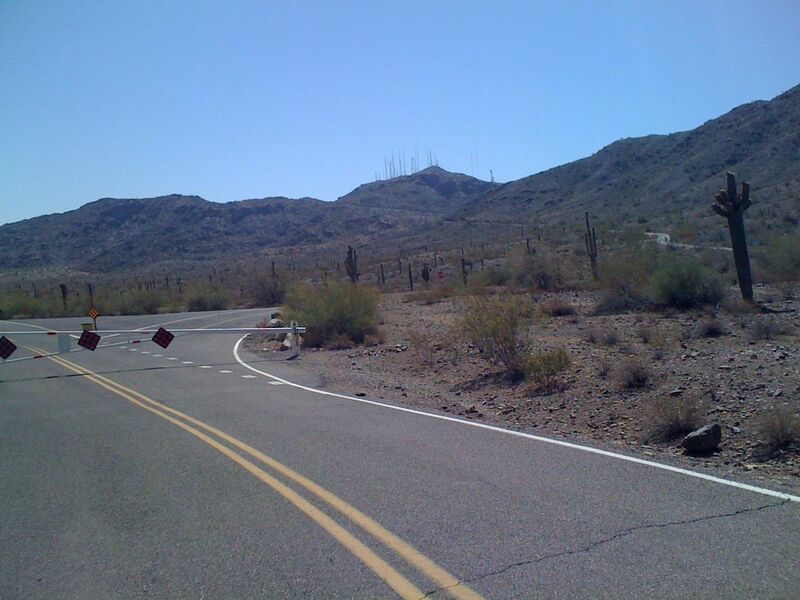 I saw a sign at the entrance that said “Silent Sunday, no motor vehicles” which probably explains why there were hundreds of other cyclists climbing the mountain. It was motivating for me to always have people up ahead to chase. On the way back down, I explored all the side roads and lookouts enjoying the amazing views. 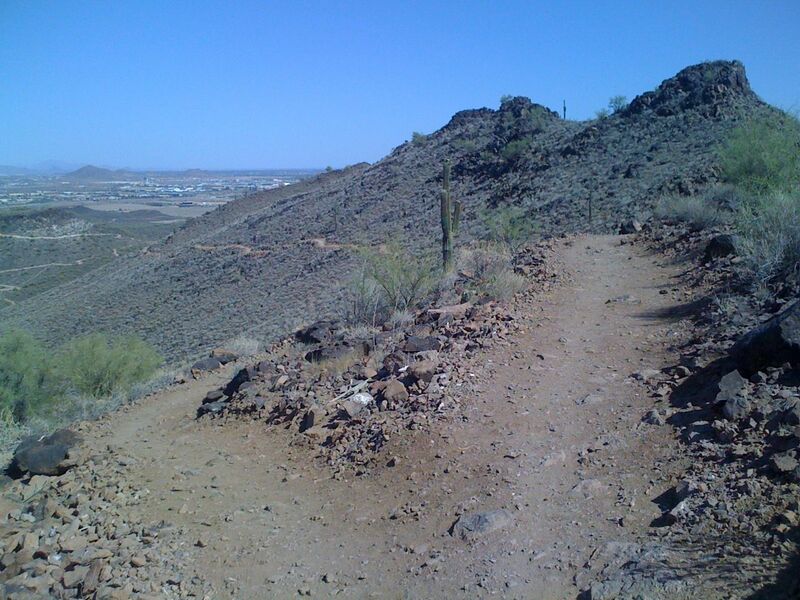 I continued on up towards Deem Hills and met Uncle Bruce for some awesome desert singletrack riding. 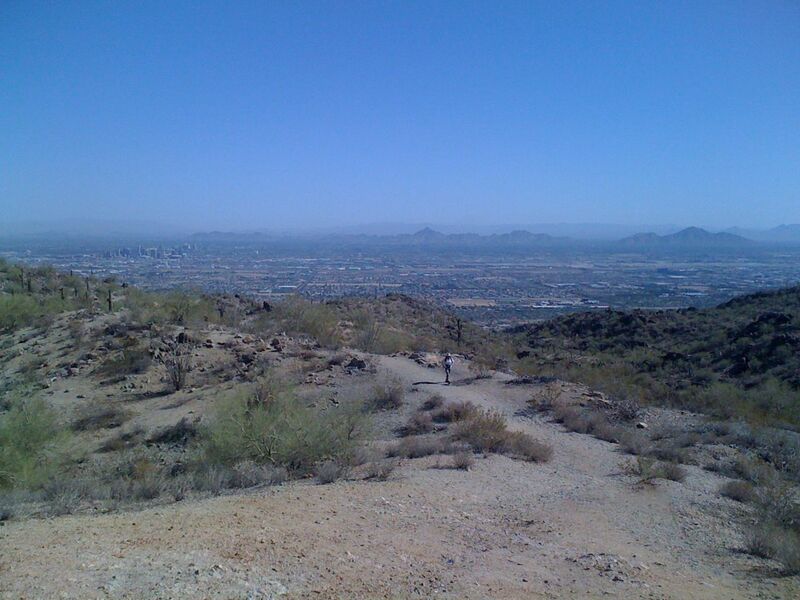 We started out by climbing from the parking lot up to the top of one of the northern peak. The climb was pretty steep in parts – particularly in the tight switchbacks. I was able to ride a couple of the switchbacks but had to walk one or two of the others. The trails were rocky in spots, but not overly technical. 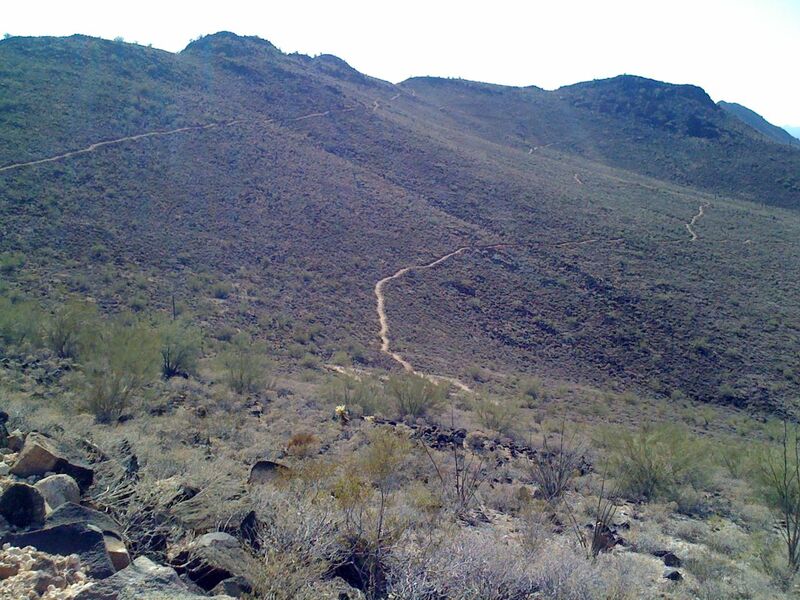 You could have fun on both the climb and the downhill. 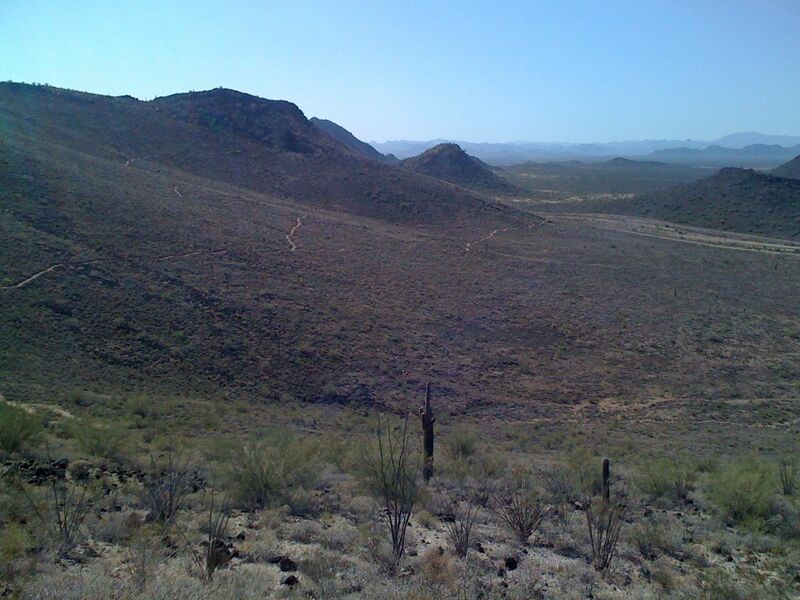 Perhaps the thing that stood out the most, though, was all the different kinds of cactus and cholla with the trails clearly visible on the sides of the hills. After we finished riding, Bruce directed me on a much better route that involved a small climb up Thunderbird canyon followed by some very cool canal trails all the way back to 7th avenue. Finally, here is a gallery of some other pics that I took while riding. They are mostly in chronological order with pictures from the sunset with Josiah first and my rides yesterday last – except for some reason the mountain bike pictures in the afternoon are before the road ride pics from the morning. 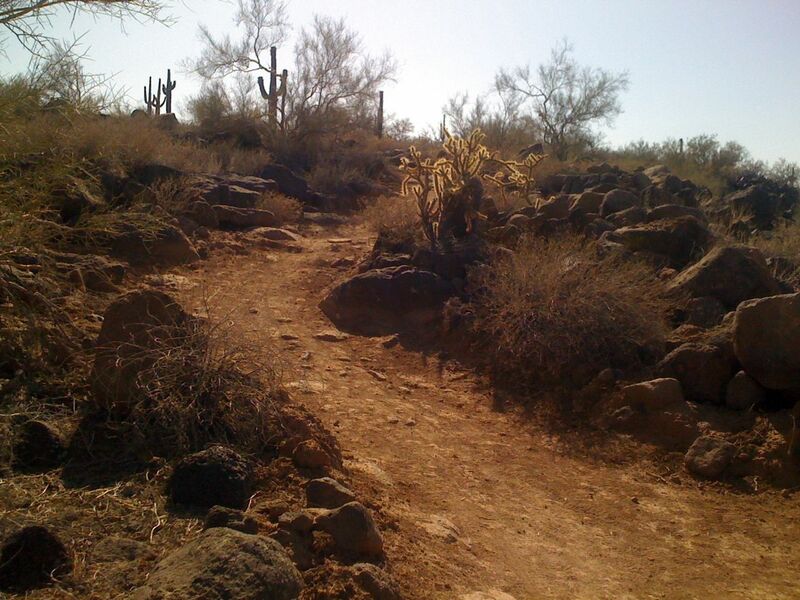 This entry was posted in Training and tagged kids, kom, strava, travel on May 28, 2012 by kartoone.